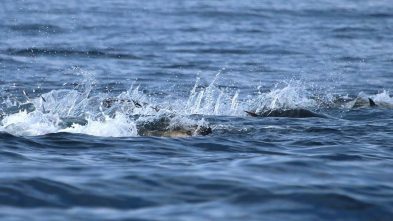 It’s January and there are crashing bluefin less than ten miles off our coast. 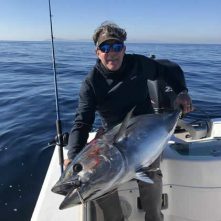 Jimmy Decker hooked a nice 61 pounder yesterday to kick start the 2019 season and capture the first tuna flag for the Balboa Angling Club, nice work Decker! March 1st rockfish season opener. New Depth restriction is now 450 feet (75 fathoms) with some exceptions. The Cow Cod Conservation areas has the max depth of 240 feet instead of 120 feet. Always check the regs before going out. 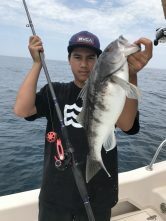 Current California Ocean Recreational Fishing Regulations 34°27 N. Latitude (Point Conception, Santa Barbara County) to the U.S. – Mexico Border. Make sure you pick up your lobster report card for 2018-2019! California’s spiny lobster, which opens Saturday, Sept. 29 and continues through March 20, 2019. Send us your reports, thanks! 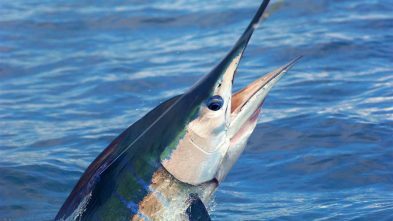 There have been a lot of local marlin released over the weekend during the local Pesky tournament. Some of the hot spots that were holding a good body of fish have been the 14 mile bank, Avalon bank, 277, the oil rigs, and the slide off of Catalina. Keep sending in your reports, and luck! 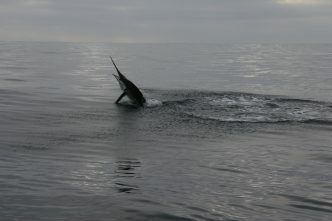 A great report came in on Sunday.. 3 marlin released off the East end of Catalina along the slide off a temp break at slack tide.. all were jig fish! Also, there have been several kelp holding dorado & yellows when running across the channel. It’s a good start, but not quite full speed yet. Keep sending us those reports! Limits of Sand Bass & Barracuda !!! 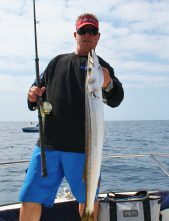 There’s a Hot Yellowtail Bite Going On! 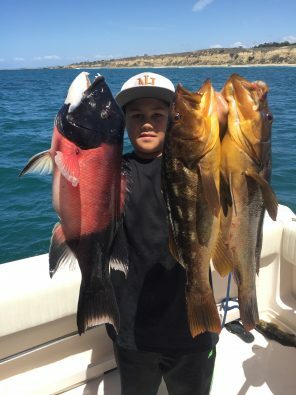 San Clemente Island has been the hot ticket lately for the yellows.. they’re ranging from 10 to 35 lbs. Guys are catching them mostly on fin bait, but they’re also chewing the surface iron. Keep sending in your reports! 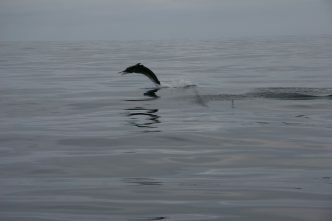 Reports are coming in that bluefin have reappeared in Southern California waters. A couple of sportboat got limits on Tuesday with 44, and averaging 60 lbs. Half were caught on the flat fall jig, and the half on live bait. Another 28 were caught on Monday aboard a 1.5 day trip. Things are shaping up! Bluefin still stacked up on the 60 Mile Bank! 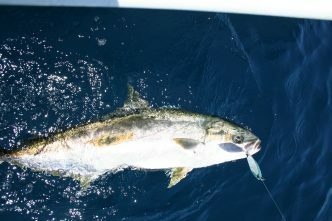 The bluefin bite hasn’t stopped yet.. they’re not the giants, but ranging anywhere from 10 to 30lbs. The go to set-up has been a 25 to 30lb rig, but when it starts slowing down, try dropping down to a 15 or 20lb fluoro top shot and a smaller hook, such as: #2 & #4. Fish hard when they start to bite.. because the bite usually ends before noon. Keep sending in those reports, thanks! 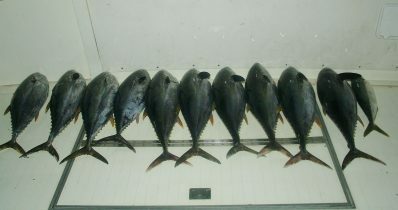 A great report came in yesterday evening.. a grip of yellowfin were caught a few miles off of Pyramid Cove. Also, the bluefin are still stacked up out on Desperation reef. The season isn’t over! Reports are coming in over the past week of marlin stacked up on the Osborn Bank. 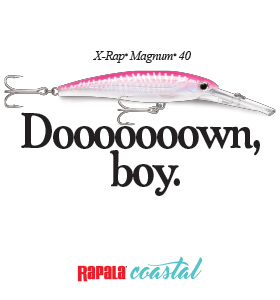 Guys are releasing double and triple hook ups. It’s about as good as it gets so late in the year. There is a good size school of yellowfin around the 226, 302 & 371 area. 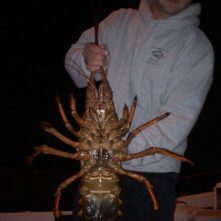 They are the schoolie kind, not much in size, but lot of fun on little line. Guys are reporting finding them by watching for bird schools, and blind jig stops. When you get hooked up, don’t forget to keep chumming with chunk and brailing bait to keep them around the boat. The water temp has been 72-73 degree. Good luck, and keep sending in your reports, thanks.